Stretch Mask and Hobby Mask — These films are especially suited for non-porous curved and irregular surfaces, making them ideal for a variety of applications. Art Mask Frisk Film — Use Art Mask for porous surfaces like canvas, gesso board, Claybord, and watercolor paper. 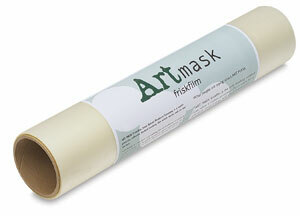 Ultra Mask — Use this professional masking film for airbrushing graphics on any surface. The solvent-proof, translucent film is tinted for easy reference and workability with maximum stretch for irregularly shaped surfaces. It's repositionable and has a paper backing for use with your plotter or cutter.